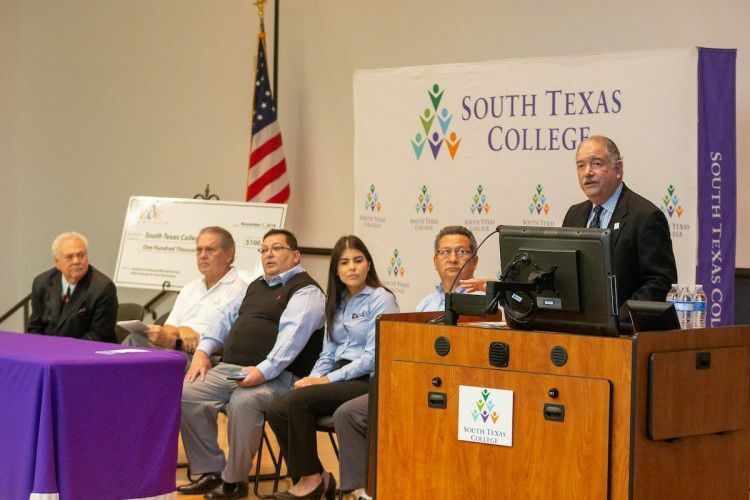 Representatives of South Texas College and Weslaco Economic Development Corporation attend a check presentation that will enable small businesses to seek training for their employees through a partnership between both entities. WESLACO — Specialized training for local small businesses might come easier thanks to a new partnership between the city’s Economic Development Corporation and South Texas College — and a $100,000 grant. The corporation presented the check to STC Thursday morning, solidifying its commitment to help provide training free of charge to its businesses, specifically those in the retail, manufacturing and logistics sectors. With the funds, STC plans to provide training to at least 150 employees in areas of need indicated by employees, said Carlos Margo, associate dean for industry training and economic development at STC. The program is set to start in December but businesses can still inquire with the EDC about becoming part of it anytime throughout the year, McDermott said. The college already provides such services to other cities out of its Technology Campus in McAllen through similar partnerships with corporations or directly through companies. This is also the first time, however, that the college will be taking this training to the Mid-Valley campus in Weslaco. Some training could be provided onsite at the companies, but whatever equipment needs to be moved to the Weslaco campus for training will be moved, Margo said. One of the businesses that will be signing up to train current and new employees is Kapal Industries, a business specializing in wood products, such as cabinetry, currently based in Donna. Daniela Gatica, executive assistant at Kapal Industries, said the business is planning to move part of its production to Weslaco by the end of the year and will expand from the current 75 employees to about 120 in the next year. Some of the training that the company is seeking for current and new employees would be in the areas of customer service, leadership skills, as well as more operational skills from accounting to manufacturing operations. The goal would be to enhance the skills of current employees, she said, to help them move up and make more money as the company grows, as well as create more jobs in the area. STC President Shirley Reed emphasized the importance of developing a skilled and competitive workforce locally. Companies thinking of moving into an area will look at the talent available as one of the most important deciding factors. “If we don’t have the numbers, where there’s high school graduates with maybe a couple years of college, good schools, access to additional training, they will look and say, ‘That’s probably not for me. Let me look somewhere else,’” Reed said. Even though this is the first contribution of its kind to STC by the city of Weslaco, the expectation is for this to grow as more businesses become aware of the opportunity and see the results of the program.